The Izu Peninsula is part of Shizuoka Prefecture, which is located on the East Side of Japan below Tokyo. 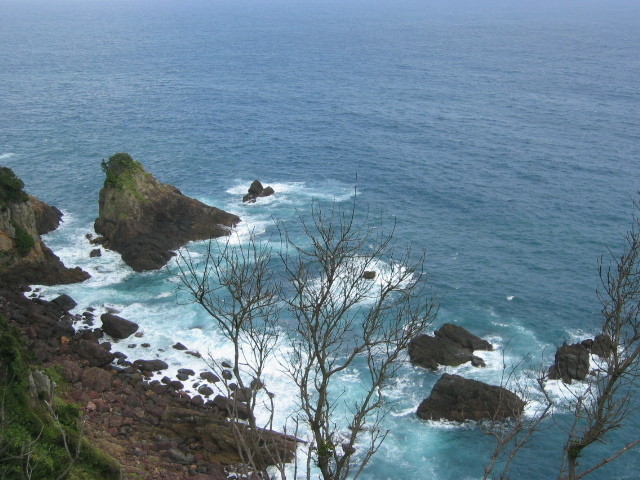 Izu is famous for it’s beautiful coastline. It is a popular travel destination for people from Tokyo and the surrounding areas. The photo above was taken below Atami, which is located on the side of Izu Peninsula that faces towards Tokyo. If you live in Japan, or plan on taking a trip here, Izu is a great place to visit at anytime of the year. While it’s probably more popular in the summer time for it’s many beaches, the numerous onsens (hot springs) can make a winter time visit great. That's a really good photo you have there! I'd like to take a trip to Shizuoka, maybe sometime in the summer. From what I've read about it, the island seems to have a rich history. I'm Nicole. I'm living in Osaka, studying Japanese, trying hard to get better. I'm also very interested in Japanese culture, and would like to travel to scenic sights not frequently found in travel guides. Izu seems like that kind of place. Would like to learn more about it. Sorry, I thought you wrote Shikoku, but you actually wrote Shizuoka. I've been there, to Fujieda and Yui, interesting places. You take really nice pictures. what kind of camera are u using? I would like to vacation at an onsen. Which is better, Hakone or Atami?